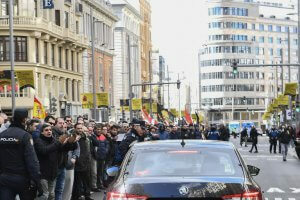 Taxi and ridesharing drivers stepped up their protests on Monday, in both Barcelona and Madrid. 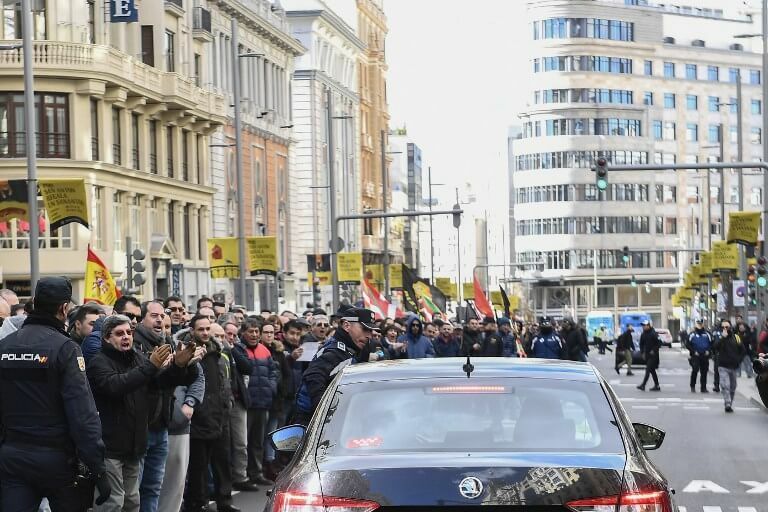 Cab owners continued blockading Barcelona’s major Gran Via thoroughfare with their vehicles for a fourth day in a row, and on Monday morning, they marched first to Catalonia’s economy department, and then on to the Parliament. Outside the entrance of the Ciutadella Park, where the parliament is, there was some tension between taxi drivers and Catalan police, the Mossos d’Esquadra. Meanwhile, ridesharing drivers also stepped up their actions, blocking four lanes of the Diagonal avenue, also in the Catalan capital. The Gran Via and Diagonal avenues are two of Barcelona’s most important roads, and are both main routes in and out of the city. Both protests therefore resulted in long traffic jams at peak hour. At the Barcelona El Prat airport, some tourists unable to find a taxi queued to get Uber or Cabify vehicles, while others went for the underground or the train. Catalan government officials were due to meet with representatives of ridesharing companies among others on Monday, and on Tuesday the talks with the taxi sector will resume. On Saturday, the Catalan government offered to taxi drivers a proposal of expanding the time in advance that services of companies like Uber have to be hired. Taxis ask for 6 hours, while the authorities were ready to go further than 15 minutes, their first offer, but without specifying a time. Yet drivers rejected the new proposal and announced that their indefinite strike continued. What the government did accept from taxi drivers’ requests is obliging their rivals to return to the base once they finish every service, as well as prohibiting firms like Uber and Cabify to geolocate their clients. For these reasons ridesharing companies’ workers did not accept the deal either. Some of their representatives said on Friday that measures like this one will mean their ‘end’ in Catalonia. Meanwhile in Madrid, taxi drivers have started an indefinite strike to protest against regulations proposed by the authorities for VTCs (Tourism Vehicles with Chauffeur). Many drivers sat on the main Gran Via street during their own demonstration on Monday. The taxi drivers in Madrid have started an indefinite just two days before the Fitur International Tourism Fair kicks off in the Spanish capital.